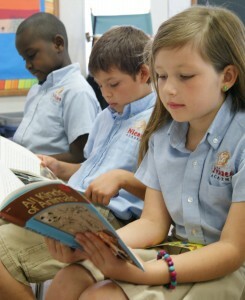 Nicaea Academy does not discriminate in its admission policies by race, color, or national origin. school. It does not discriminate on the basis of race, color, national and ethnic origin in administration of its educational policies, admissions policies, scholarship and loan programs, and athletic and other school-administered programs. The Academy complies with all state and county school-related laws. In accordance, the following information must be on file with the Academy prior to starting school. • A Florida State Physical examination Form 3040. Certificate is valid for two years. In the event such information is not on file within the specified time period, notice to parents to provide the same will be sent home. We may require that your child be dismissed from attendance until you comply with all state and county regulations.